While I enjoy the museums and normal tourist spots, I absolutely love the weird and unique places that show individuality and originality. The Midwest region has more than its fair share of fun places to visit. Meet James Frank Kotera (JFK) in Wisconsin, who is still winding. These are the epitome of bizarre and fun. Picturing the work, time, and even money that went into these balls shows the passion these people have. There are different definitions of the biggest ball of twine so visit several of them to make your own decision. 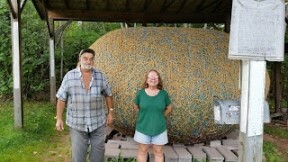 The biggest and first (1950-1979) sisal ball of twine by one person is in Darwin, Minnesota. The heaviest ball of twine by one person is in Lake Nebagamon, Wisconsin. This is in his backyard and JFK (James Frank Kotera) is happy to meet visitors. Cawker City, Kansas, has the largest ball of sisal twine made by multiple people. You can even add twine yourself. The largest nylon twine ball is in Branson, Missouri, in Ripley’s Believe or Not Museum. 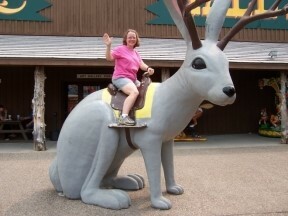 Riding the jackalope in South Dakota. Blatantly and humorously advertising your “tourist trap” can work. Obviously these stops are very commercial but are still fun and free to look at. The “Da Yooper Tourist Trap” in Michigan is a worthwhile stop. The displays are big and include things like Big Gus, the World’s Largest Working Chainsaw, and Big Ernie, the World’s Largest Working Rifle. The store is small but quite good, especially the rock section. Signs for Wall Drug Store in South Dakota line the road for miles touting the free ice water available at the stop. It’s not just a store but several buildings in a compound with displays along with things to buy. We enjoyed seeing the dinosaurs, stuffed animals, mining town, and especially the large jackalope. The water was nice, too. While there are terrific large space museums, the smaller ones that commemorate local astronauts are quite fascinating. The Midwest is full of them. Almost hidden away in his Indiana hometown of Mitchell is the Virgil I. Grissom Memorial. Gus was the second American astronaut, part of the Gemini program, and died during tests for the first Apollo flight. 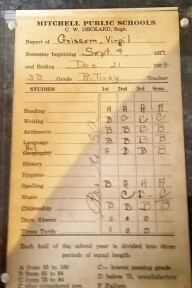 This museum has large items like the Gemini III capsule but also his elementary report card when he was evidently not the top of his class in writing or music. Roger B. Chaffee is remembered with a planetarium named after him in his hometown of Grand Rapids, Michigan, in the Grand Rapids Public Museum. He died in the same Apollo test with Grissom. Wapakoneta, Ohio, built a wonderful museum for their hometown boy, Neil Armstrong, who first walked on the moon. The look of the outside evokes a futuristic moon base. While it includes major displays like the Gemini VIII capsule, it also has his boy scout’s patrol flag. Janice Voss flew on the shuttle in space five times and tied the flight record for female astronauts. She considered Rockford, Illinois, as her hometown and is remembered in an exhibit at the Discovery Center Museum. If you don’t have something special in your town, you can invent something. 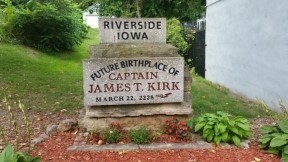 Captain James T. Kirk in the Star Trek TV series mentioned that he came from a small town in Iowa. The town of Riverside, Iowa, decided that he will come from their town. The town has a museum, a festival, and a monument located where he will be born in the future. A statue of Captain Kirk was revealed in 2018 in Hall Park. Go to Murphy’s Bar and Grill for a sandwich and see the signs showing that it will be the future Shipyard Bar and the place where Captain Kirk will be conceived. It is a fun place for all us geeks. Former Longaberger headquarters in Newark, Ohio. This building is on many worldwide lists of quirky architecture. 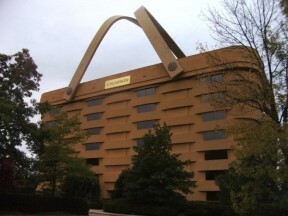 The Longaberger Company built this building in the shape of a basket with handles as its headquarters near Newark, Ohio, but had to sell it as the company hit financial problems. It is now owned by an investor who hopes to keep it as it is. The first time I saw this building I was unprepared for it as it came out of a foggy mist when I drove through the area. Very surreal! 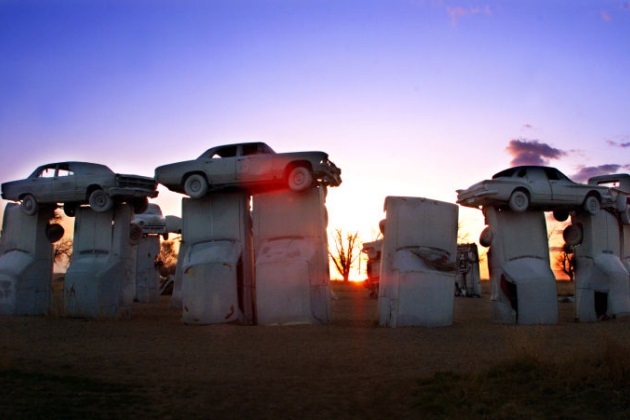 There are many homemade versions of Stonehenge built in the United States but Carhenge may be the most famous. It uses 38 different vintage American cars to replicate Stonehenge. Built during a family reunion in 1987, it now has a visitor center and additional car art. It is located in Alliance, Nebraska. Sign marking the route to the crash site. Buddy Holly, Ritchie Valens and the Big Bopper died in a plane crash after playing in the Surf Ballroom in Clear Lake, Iowa, back in 1959. The ballroom still has concerts but also has an excellent museum with both items connected to that concert such as the pay phone that Buddy Holly and Ritchie Valens used along with information from concerts through the years. Just a few miles outside the town is the location of the plane crash. 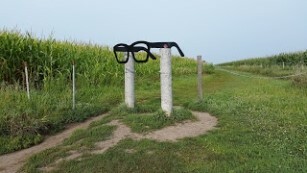 Large Buddy Holly glasses mark the grassed route back to the crash site. The site has several memorials along with items left by visitors. North Dakota has large animals built all through the state. This is perfect for a quick photo opportunity except for the time required to drive to them! Salem Sue in Salem may be the most famous. She was built in 1974 and is 38 feet high. Other large animals include a buffalo (26 feet high in Jamestown, built in 1959), a turtle (30’ high in Bottineau, built in 1978), a second turtle (built in 1982 in Dunseith), a catfish (40’ long in Wahpeton), and a walleye (26’ feet long in Garrison). 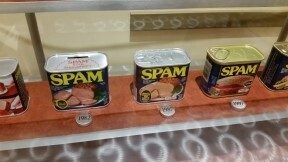 I know that going to the Spam Museum in Minnesota is on everyone’s bucket list to celebrate this canned meat. There are normally samples available to taste. The museum discusses the history, the making, and the variety of Spam (there are 19 different versions). The gift shop has both Spam clothing and sells all types of Spam. Enjoy and celebrate the weirdness when you travel. Do you have a favorite? Cindy Belt and her husband John were RV full-timers for several years traveling the U.S. They now RV on a part-time basis and enjoy retirement on a full-time basis. They blog their travels at tandtrv.blogspot.com.